I am obsessed with and by sea-weeding. I hanker after a hobby enjoyed by the Victorians, who were avid seaweed ramblers. In summer, I wear as little as possible and in winter a warm wetsuit. Sensible dress is important. To quote Mrs Alfred Gatty in her book of British Seaweeds (1863). Next to boots comes the question of petticoats; and if anything could excuse a woman for imitating the costume of a man, it would be what she suffers as a seaweed collector from those necessary draperies! ….and let the petticoats never come become the ankle. I am a forager and keen cook. 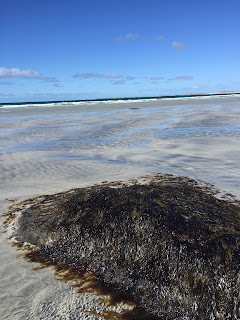 Hedgerows and woodland is sparse on the Outer Hebrides and so I turned to seaweed. My seaweed obsession broke with the Hebridean tradition of cooking with carrageen; my first culinary experiment looked at storm-cast dulse. Do not do this at home. Choose freshly cut seaweed, not seaweed washed up by the tide. 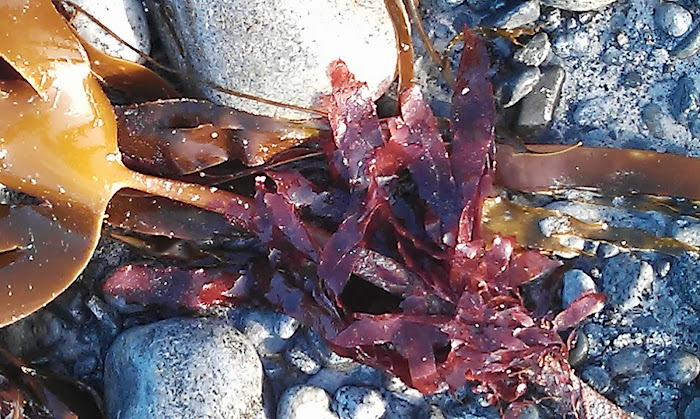 I was (and still am) an amateur seaweed cook but I was struck by the red seaweed, dulse as it glistened in the winter sun. The ferry company Caledonian MacBrayne provides a lifeline service to the Western Isles but at times it is unreliable, and so, in the absence of terrestrial vegetables in the supermarket, I turned to food from the ocean. My dulse turned green when cooked and was quite delicious. Dulse unlike kelp, cooks in a similar time to potatoes. 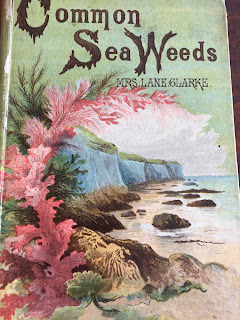 Researching my book, Seaweed in the Kitchen, I stumbled upon a group of Victorian ladies who collected seaweed. Amongst them was the author, George Eliot . 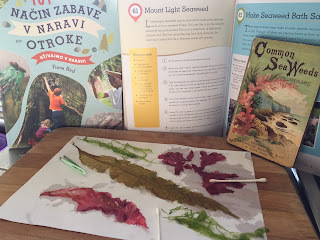 Eliot wrote that she was ‘Quite in love with seaweeds’. In the same era, Wedgwood created a seaweed dinner set. In my book, I name these ladies The Seaweed Sisterhood. Said ladies also posted the occasional rarity to male scientists who then classified them. Here we are at the seaside for our summer holiday – the hot and dusty city a past thing like a weary dream of the night…who that has a home full of young lives does not rejoice to see the rush out upon the sunny sands and the preparation for sea-weeding. Fast forward five years and I was asked to write a book encouraging children to explore the out of doors. I encourage creativity: a beach litter clean–up - an octopus made from a plastic bottle with dried dusle for hair. A charming, chiming mobile made from shells and dried seaweed and, in the footsteps of Victorian children, pressed and mounted seaweeds. We are told that Queen Victoria owned a seaweed album. Alas, this pastime is no longer fashionable. It should be. 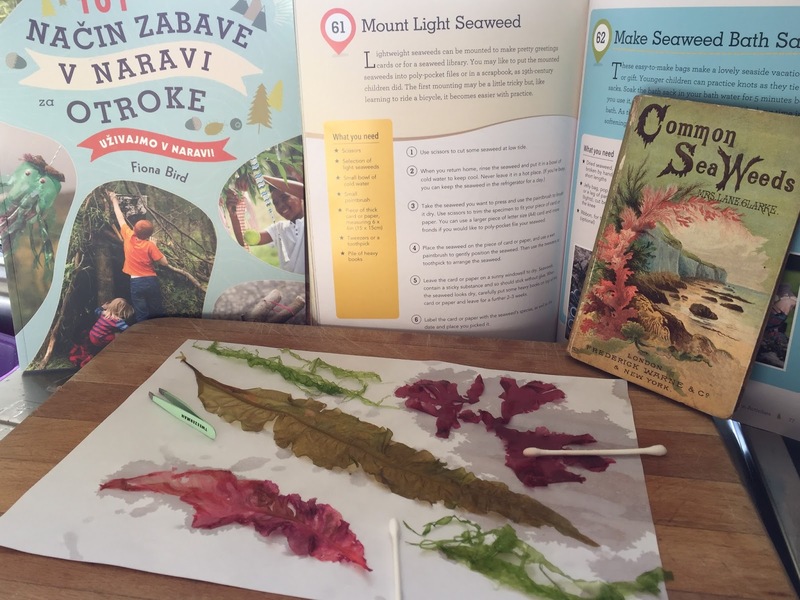 We need to be in touch with our natural world.Go sea- weeding and breathe. The Japanese love affair with nori is well known, if only through sushi, but the Japanese affection for the British phycologist, Dr Kathleen Mary Drew Baker (1901-57) is probably less widely recognised. In Japan, Kathleen Drew (Baker was her married name) is known as Mother of the Sea. After researching laver, a British seaweed akin (but not the same as) to nori, Baker published a very brief note in the 1949 journal ‘Nature’ titled, ‘Conchocelis phase in the life history of Porphyra umbilicalis’; it was described as 100 lines that should change the world (Michanek 1996). This is because Kathleen Drew identified the missing link in the life cycle of porphyra. Heteromorphy is the alteration of generations, which means that in the case of porphyra it takes on different appearances during its life cycle. In 1948 a series of typhoons led to the collapse of Japan’s production of nori and many famers lost their livilhood. Prior to Drew’s discovery porphyra life stages were thought to be two different species. 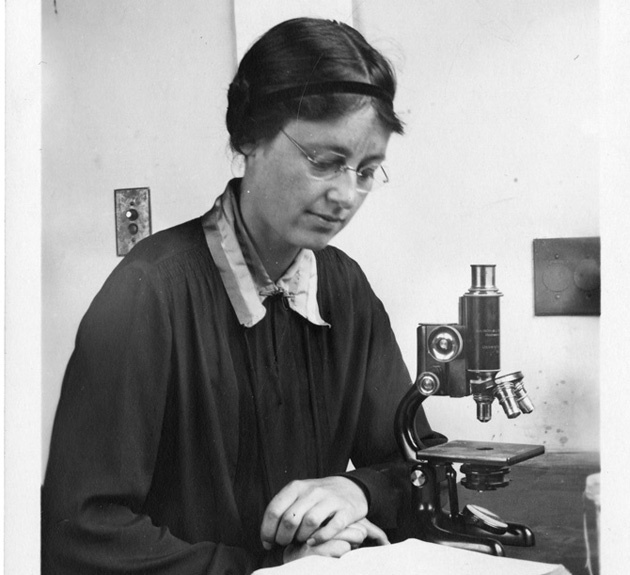 Kathleen Drew’s research changed the way that nori was cultivated and resulted in a guaranteed harvest. Japanese scientists built on Drew’s research to develop the nori industry.Previously the nori harvest varied and as a consequence, the seaweed was known as ‘Gamblers’ Grass.’ Grateful nori farmers contributed posthumously to a statue in Kathleen Drew’s honour, and each year on April 14th (Drew’s birthday) in Sumiyoshi Shrine Park, Osaka, nori farmers celebrate the Drew Festival. Today, (April 14th) the park will be decorated with flowers and visited by leaders in the Nori industry. The demand for nori increased after the Second World War, resulting in improved farming techniques and nori becoming the largest aquamarine industry in Japan.